The Dunbar Dollar. The Kitsilano Rouble. The Riverview Lira. The Cambie Pound. No, you’re not hallucinating. Vancouver may one day include a number of different currencies in circulation within the city. Citizens from the Village Vancouver Transition Town initiative are hard at work preparing for the Dunbar Dollar’s 2011 launch. Based on successful projects initiated on Vancouver Island, the Dunbar Dollar and other community currencies are envisaged to be an alternative that one day would serve the community, its businesses and its people. But let’s take a few steps back and see what money is. Exchanging goods for other goods is not always practical or useful; direct barter requires the notion that “I have something you want and you have something I want,” but the timing of those wants need to coincide. Recognizing this problem, the early civilizations of Mesopotamia came up with a way to facilitate the exchange of goods or services: money. Almost any object can serve as currency; the most important thing is that everyone in a community recognizes the object as money and treats it as such. The first form of money was barley and not the paper and coin varients that we are familiar with today. At different times and in different contexts, objects used as money varied from gold and silver specie to spices and other goods of value. But it was bank notes that altered peoples’ concept of money. To accept a piece of paper in exchange for a good or a service might be practical, but it hasn’t always enjoyed universal acceptance. There are communities throughout the world with their own local currencies, including right here in British Columbia. Salt Spring Island has used a local currency since 2001. Often, these currencies are backed by national reserves to bolster its stability. The Comox Valley and, more recently, the Kootenays are other examples. The Comox Valley Community Way creates an informal partnership between local businesses, community organisations and the people of the region. Businesses donate community currency to the community group of their choice. Community groups then spend this currency at participating local businesses, or exchange it for Canadian dollars. Businesses can then use the currency at other local merchants to source goods and services from the community, and more. This results in a continual, circular flow of the currency throughout the community; independent of the larger national or global macroeconomic fortunes. 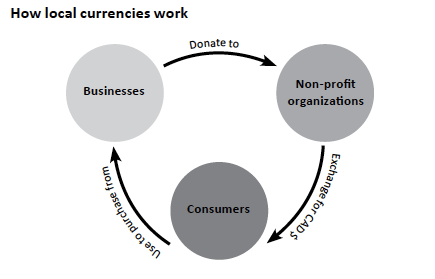 Local currencies tend to have better circulation than traditional money, and a higher local multiplier effect, which helps facilitate local exchanges that match local resources with local needs – all while building a sense of community. In this way, local currencies contribute to greater economic resilience. Local currencies can certainly become an important part of the way in which communities around the world continue to thrive. Establishing a local community currency in an urban context is surely a significant challenge, but Village Vancouver is prepared to take this challenge, just as it has taken urban farming and other community resiliency projects before. Visit www.dunbardollar.com for more information on the Dunbar Dollar community currency project.